With over 35years experience in the demolition industry TDD has set new standards with up to date equipment and technology to meet expectations and aggressive scheduling. Full or Partial Demolition, Residential, Commercial and Industrial - No job is too big or small we do it all! Whether it is partial, selective or complete structural removal we have the capability and knowledge to tackle any project. The environment is important to us so we create strategies and solutions to minimize environmental impact. If any hazardous materials are present, they are assessed, removed and disposed within local and federal regulations. In order to sustain an eco-friendly environment TDD can assess what materials can be reused and recycled. Recycling material is important to us now and our future generations. By maximizing the amount of recycled materials we can effectively reduce with amount of waste sent to the local landfills. The typical materials recycled include the following: Asphalt, Concrete, Green Waste, and Metals. At the start of every construction project the site needs to be prepped. 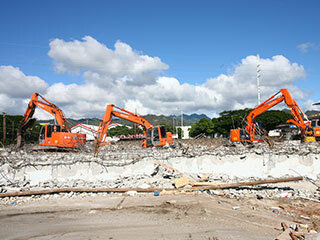 Whether it's an existing structure to be demolished or vacant land that needs to be cleared and graded. Site prep services include land clearing, excavation, backfill and compacting. TDD has experience and capability in working with all types of soil conditions related to mass-excavation and foundations. All of these factors contribute to meeting your schedule and budget.